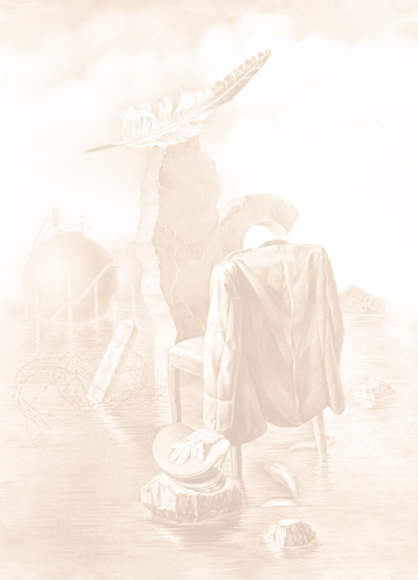 Stephane Lemaire - 2008 - "L'etang de Kukufah"
Prolusion. Stephane LEMAIRE is a composer and musician from France, who first appeared on the album "Removing" by the French outfit Moving Gelatine Plates in 2006. "L'etang de Kukufah" is his first solo album, released on Musea Records’ sub-label Dreaming in 2007. Analysis. When reading up on Lemaire's influences and inspirations, you know that you'll be in for an original experience. Electronic music pioneer Klaus Schulze, Fripp & Eno, Scandinavian jazz and the highly regarded minimalist composers Phil Glass, Steve Reich and Terry Riley make for a varied group of artists and styles to draw inspiration from, most of them with the common trait of making music that hardly can be classified as commercial. The 15 compositions on this album do share some common traits, though, and one of the most noticeable is the mood and atmosphere created in the tunes. There is a distinct feeling of uneasiness about all the compositions here. The songs are eerie, slightly sinister, sometimes menacing. It is slightly creepy to listen to these pieces, and although not fear-inducing as such, the moods explored tend to make the skin crawl slightly. This isn't music for horror movies though, as there are hardly any dramatic chill-inducing moments here; it's more like music fitting for a good, old-fashioned ghost flick. The compositions themselves are varied in style and quality. Most of the tunes have clearly defined minimalist elements to them, either in parts, passages or the individual tracks as a whole. A few tunes here are highly minimalist, being made up of repeated passages from start to finish with only minor variations in execution. Most often the matter is explored in more subtle ways, though, by repeating one or more segments in multilayered compositions, by inserting passages where the melody fades to a sound with few melodic elements or by repeating dominating sonic fragments throughout the song, thus creating a strong feeling of repetition, even if the tune as a whole is anything but repetitive. Contrasting the minimalist influence is a style which is anything but that, also. Quite a few passages are constructed by playing multiple layers of sounds, samples and keyboards. Melodic fragments and brief noises come and go, and the melody is formed by a succession of different noises and sounds, many times with one or more layers of floating synths adding a bit of extra texture as well as providing some sense of continuity to these segments. At times these rather complex passages are constructed seemingly with the purpose of not conveying a melody, though, but of creating chaotic, cacaphonic soundscapes where disharmonies and dissonances are the name of the game. Both these variations of complexity give the impression of being improvised to a greater or lesser extent, and quite a few times with some rather jazz-sounding licks being a part of the mix. The tunes are given nerve and tension by the use of contrasting sonic pictures, with dark and ominous sounds mixed with lighter ones, often with a slightly eerie mood to them. This contrast is the foundation for the chilling moods conveyed on this album, with the aforementioned musical aspects providing the additional textures and variations needed for the atmosphere to stick. Conclusion. "L'etang de Kukufah" is an adventurous and experimental album that should appeal to aficionados of this in the realm of electronic music. Being familiar with minimalist as well as avant-garde music will be helpful, and perhaps even needed, to enjoy this album, but followers of both styles may find this release interesting even if only enjoying one of them minimally. Personally, I found this to be a mixed release, as some tunes got to be too minimalistic in their expressions to suit my personal taste. Even so this is a rather good recording, worth checking out by the curious.